The Swiss-Thai Chamber of Commerce is pleased to announce that the next Annual General Meeting will be held on Thursday, March 28th, 2019 at 18.30 hrs. at Arnoma Grand Bangkok Hotel (agenda attached). Registration starts at 18:00 hrs. The dinner followed at 19.30 hrs. will be free of charge for members (1 person per company) who confirm your participation in advance. Reservation form is also attached. The guest speaker at the dinner is Henning Glaser, Executive Director and Chairman of the board of directors of the Asian Governance Foundation. 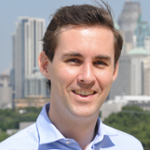 The subject will be “China´s rise to power – and its implications for the USA and Asia”. In order to have the required quorum, kindly register your participation or send us your filled in proxy form. 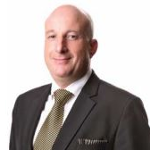 Our Stamm-Father Daniel Reinle invites you cordially to visit our monthly Stamm on Thursday, March 14, 2019, at Mango 99 Restaurant of Arnoma Grand Hotel Bangkok, Ratchadamri Road. 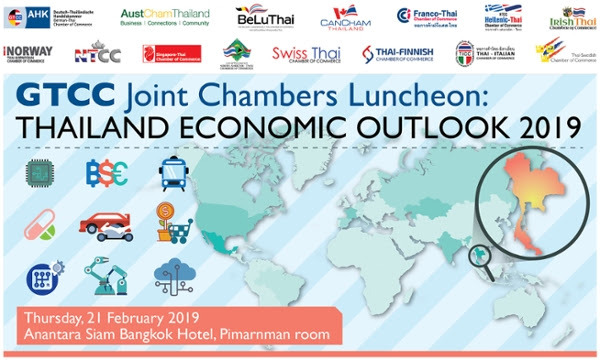 Please find here the invitation to the Joint Chamber Luncheon “Economic Outlook 2019” organized by the German Chamber of Commerce. GTCC Joint Chambers Luncheon "Thailand Economic Outlook 2019" will provide you with an overview of global and regional challenges with a focus on Thailand's economic development for 2019 towards "Thailand 4.0", introduced by our keynote speaker Mr. Prinn Panitchpakdi, Governor, Stock Exchange of Thailand (SET). Representatives of GTCC member companies Siemens Thailand, BMW (Thailand), Continental Automotive, Boehringer Ingelheim (Thai) and Rabbit Finance will discuss Thailand's transformation to Industry 4.0, insights into key industry sectors in Thailand, and challenges to face in 2019. Our Stamm-Father Daniel Reinle invites you cordially to visit our monthly Stamm on Thursday, February 14, 2019, at Mango 99 Restaurant of Arnoma Grand Hotel Bangkok, Ratchadamri Road. SSB Bangkok Luncheon "by bicycle from Switzerland to Bangkok and onwards. with Maria-Theresia Zwyssig on Tuesday the 15th of January 2019 at the Arnoma Grand Bangkok. THB 800 net per person including Soft drinks to be served before the lunch and during the lunch. House brand beer and wine by the glass available at THB 180 net per glass for participants to order and pay on consumption. Deadline for registration or cancellations: Friday, 11th January 2019, 12:00; no shows will be invoiced. 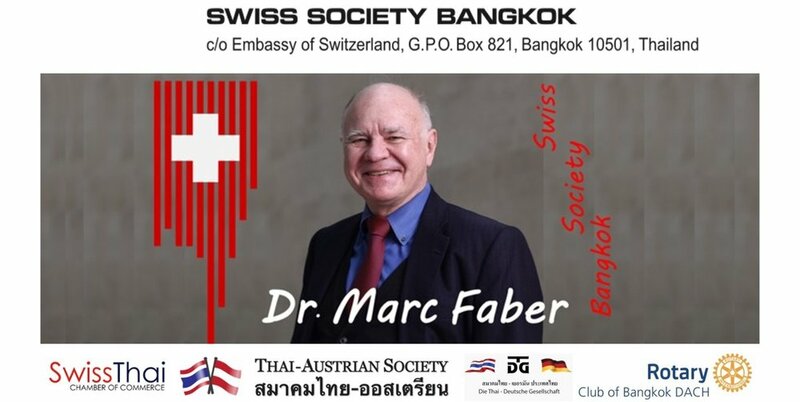 This is an event organized by the Swiss Society Bangkok. STCC members and Friends are invited to join at the same conditions. Dear Members and Friends of Swiss- Thai Chamber of Commerce : Our Stamm-Father Daniel Reinle invites you cordially to visit our monthly Stamm on Thursday,January 10th 2019, at Mango 99 Restaurant of Arnoma Grand Hotel Bangkok, Ratchadamri Road. 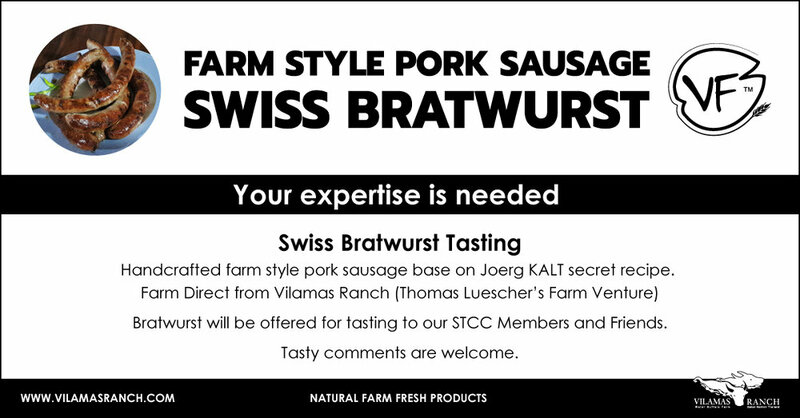 Please rest assured that Eric’s Team are proud and motivated to welcome the STCC Stamm back to Mango 99 in 2019 and that this modest increase will be understood and supported by all in order to maintain the generous buffet spread and drinks Arnoma Grand delivered during 2018. The Franco-Thai Chamber of Commerce (FTCC) and FTCC Young Professionals (FTCC YP) in cooperation with other Bilateral Chambers of Commerce in Thailand are delighted to invite you to our kick-off event of << Inter-Chamber Young Professionals Networking Night 2018 >>. 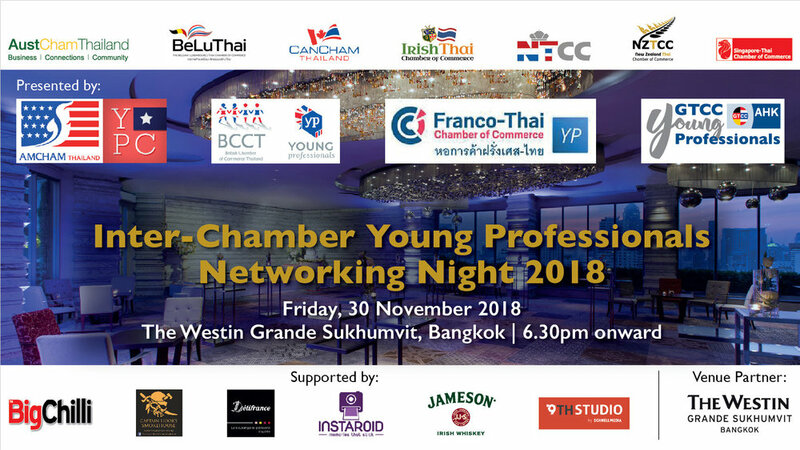 AMCHAM, BCCT, FTCC and GTCC Young Professionals will host the very first “Inter-Chamber Young Professionals Networking Night 2018” on Friday 30th November at The Westin Grande Sukhumvit. The joint event will provide you with a fantastic opportunity to meet and network with hundreds of young professionals from all over the city. Join us for this special evening to get together in the wonderful ambiance of the Altitude Rooftop in the heart of Bangkok. Bring your friends and colleagues along to a very special and cheerful YP Networking. Tuesday, 20 November 2018 18.30 - 21.30 hrs. Join us and feel free to bring your friends along to our last Stammtisch Bangkok of 2018! 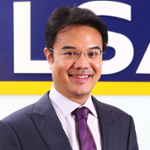 We also extend the invitation to the Advantage Austria and the members of Swiss-Thai Chamber of Commerce. Take this opportunity to meet our guests of honour German Ambassador-Designate H.E. Georg Schmidt, Swiss Ambassador H.E. Ivo Sieber and Austrian Ambassador H.E. Dr. Eva Hager. Please be advised that photographs and video footage will be taken at the event for use on the GTCCs website, in the member magazine, in marketing materials and in other online media such as LinkedIn, facebook, flickr and twitter. By participating in the event, you hereby agree. Shooting star, Swiss pop singer Veronica Fusaro, will be our special guest. Dear Members and Friends of Swiss- Thai Chamber of Commerce : Our Stamm-Father Daniel Reinle invites you cordially to visit our monthly Stamm on Thursday, Sep 13, 2018, at Mango 99 Restaurant of Arnoma Grand Hotel Bangkok, Ratchadamri Road. In order to plan the main dishes, please send in the participation form below not later than: Sep 13, 2018 before 15:00 hrs. Bangkok, July 24, 2018 Dear Members and Friends of Swiss- Thai Chamber of Commerce : Our Stamm-Father Daniel Reinle invites you cordially to visit our monthly Stamm on Thursday, Aug 9, 2018, at Mango 99 Restaurant of Arnoma Grand Hotel Bangkok, Ratchadamri Road. In order to plan the main dishes, please send in the participation form below not later than: Aug 8, 2018 before 15:00 hrs. Time : 7:00 pm. - 9:00 pm. Information : Mark your diaries, Cheese and Wine pairing is coming to Arnoma Grand! On Thursday June 28 - join us for a great evening of Wine and Cheese pairing with 14 different cheeses from the World paired with 5 different types of Italian Wines. A selection of cold cuts and hot dishes will complement the event. The cheeses are provided by KCG Corporation and the Wines by IWS who will also provide their respective expert to comment all the products and the best way to fully enjoy them together. The price is only THB 980 net per person.